Wanda Beth McGuire, 91, of Russellville, died Sunday, September 9, 2018, at Russellville. The daughter of David and Otha Elizabeth (Judkins) Weir, she was born November 25, 1926, in Gumlog. She was a housewife and a member of the Woodlawn Freewill Baptist where she enjoyed studying God's Word with the fellow members of her Adult Sunday school class. She enjoyed sewing and being outside. The family would like to express a special appreciation to Dr. Jeff Yates for his attentive care and friendship to Wanda over many years. Wanda was preceded in death by her husband, James Everette McGuire; her parents; and brothers, Carroll Weir and Van Edwin Weir. 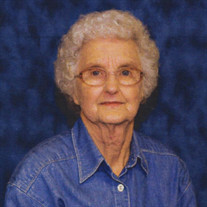 She is survived by her daughter, Jamie McCaslin (Don); and grandson, Phillip McCaslin, all of Russellville. Funeral Service will be held at 10:00 AM, Wednesday, September 12, 2018, at Humphrey Chapel. Rev. Jerry Burris will officiate. Burial will be at Old Baptist Cemetery in Russellville by Humphrey Funeral Service. Visitation will be one hour prior to the service from 9:00 am to 10:00 am, on Wednesday, at the funeral home. Memorials may be made to Woodlawn Freewill Baptist Church, 110 Sequoyah Way, Russellville, AR 72801. Internet obituary and on-line guest book are available at www.humphreyfuneral.com.